Following the devastating impact of Cyclone Idai and the unprecedented loss of life and property in Zimbabwe, Mozambique and Malawi, the African Development Bank (AfDB) has announced a multi-pronged response plan for the three countries. The Bank will be providing emergency assistance to the affected countries and a medium-term plan to meet the reconstruction needs of the affected areas, including a climate risk insurance plan. 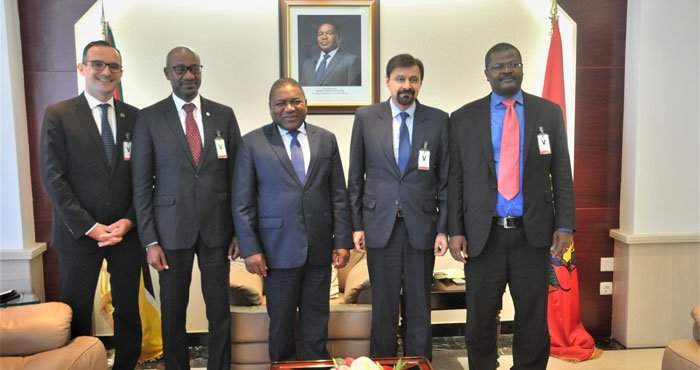 A high-level Bank delegation, headed by its Vice President for Corporate Services and Human Resources Mateus Magala, met with the President of Mozambique, H.E. Filipe Jacinto Nyusi, in the country’s capital, Maputo, to convey his sincere condolences on behalf of the Bank, and to announce the assistance. President Nyusi described the Bank’s intervention as unique and comprehensive, assuring that it would go a long way to help victims restart their lives. He particularly welcomed the Bank’s expression of leadership in helping the country get climate insurance. “The African Development Bank is our Bank. I have been interacting with the Bank for years now, but the intensity of engagement with the Bank’s current leadership is even higher than usual,” said the President of Mozambique. The first phase of the plan consists of a special relief fund of $1.7 million for Mozambique, specifically for the immediate humanitarian relief effort in the worst affected areas. In the second phase, the Bank will set up a response and reconstruction programme, committing up to $100 million for Mozambique, Malawi and Zimbabwe to kick-start economic recovery and rehabilitation. A team is working to support the governments of the three countries, using the Bank’s convening power to assess needs, identify key reconstruction activities, and mobilise resources from the international community, global philanthropic organisations and the general public. The Bank’s delegation also included: the Director General, Southern Africa Regional Development and Business Delivery Office, Kapil Kapoor; Eugenio Paulo Maria, adviser to the Executive Director for Mozambique, Zimbabwe, Namibia and Angola; and Pietro Toigo, the Bank’s Country Manager for Mozambique. The Bank is working to put together a long-term solution to climate risk in Southern Africa, a region subject to a continuous cycle of floods, droughts and cyclones, and one of the most vulnerable in the continent. Speaking shortly after meeting with the Mozambique President, Bank Vice-President Mateus Magala said: “We would like to rebuild and modernise this corridor to be more resilient and to energise the region’s economic activities without climate pressure or any other constraints”. Following the devastating impact of Cyclone Idai and the unprecedented loss of life and property in Zimbabwe, Mozambique and Malawi, the African Development Bank has announced a multi-pronged response plan for the three countries.